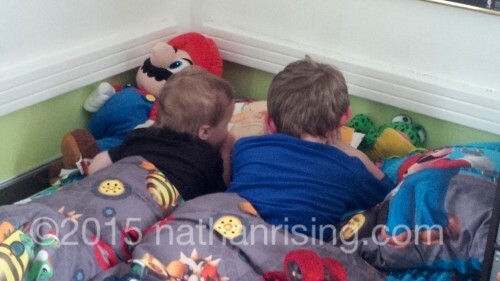 It’s sights like this, seeing big brother Nathan reading a story to his baby brother, that make my heart melt. Such a precious sight to see. Now if only they did this more often instead of bickering over toys!! 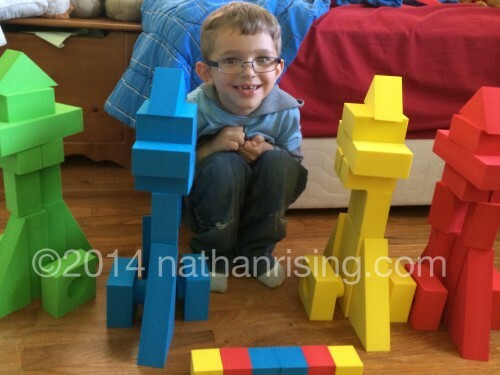 He had made four identically built rocket ships out of some blocks his grandma had gotten him a while back. He was so pleased with his creation, as were Paul and I. Just think, a few months ago, this would have been impossible for him. But now look at him! I’m so proud of how far he’s come. The preschool we sent him to in order to get him help for his Autism was one of the best decisions we could have possibly made. He has come so far! Plus, it’s awesome how he loves, loves, loves to go to school. I hope that love sticks with him! 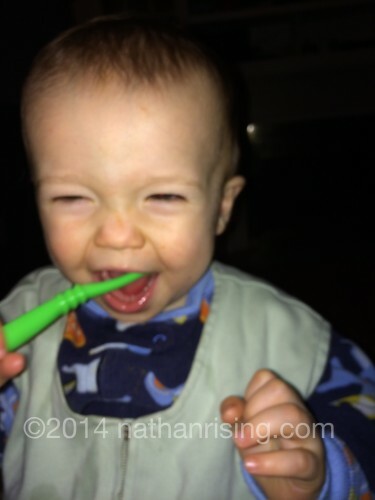 Mr. John loves, loves, loves brushing his teeth. He doesn’t scream and fight it like Nathan did. He DOES try to bite the toothbrush so he can get the toddler-approved toothpaste off though! Apparently, he thinks it’s delicious. He especially likes when I’m done brushing his teeth and I hand him the toothbrush so he can finish.